Manufactured in Grande-Bretagne from Circa 1936 until 0. 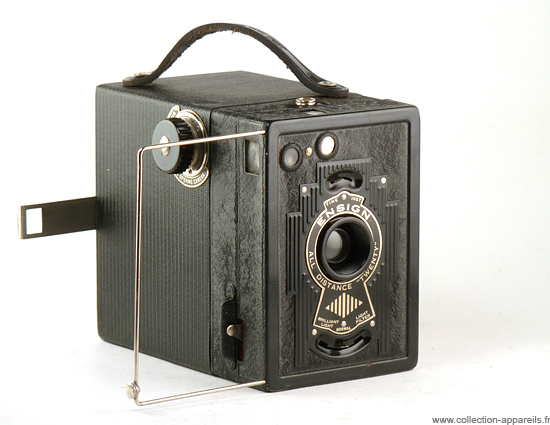 The Ensign All Distance "Twenty" is a all metal box camera, solid. As usual, it has the two internal viewfinders (horizontal-vertical), but it has a viewfinder more "sport" of the retractable type.. The adjustment of the distances (hence the name "All Distance") is done by pulling more or less the lens. There is no adjustment scale, and we can assume that its use is binary: landscape or portrait following the lens is fully pulled out or fully retracted. There are two apertures (brilliant or normal) and a yellow filter using a common pivoting blade. Manufacturing is neat: the front face can be easily removed (no rivets), the trigger is protected by a velvet trim and an outgrowth preventing accidental handling, a small button allows to pull out the frame of the sport viewfinder. The finish is elegant: cracked paint on metal, decorated front, coating with roped patterns .